Image caption Michelle Oddy says the risky operation should give her "a much better quality of life"
A woman waiting for a rare multi-organ transplant has said all she wants is to lead a normal life and eat a proper meal. Michelle Oddy, 43, was diagnosed with Crohn's disease as a teenager and can only consume liquids following several operations. She is now hoping the transplant procedure will save her life. Ms Oddy has been warned there is a risk of death but said she feared she would die anyway without the operation. 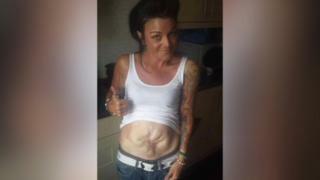 The hairdresser is hoping to join a waiting list next month to get half a stomach, a new large and small bowel, intestines, pancreas and liver. "I've changed my mind so many times about it," the mother-of-one from Ilkeston, Derbyshire, said. "It's something that needs to be done so I can run a normal life with my wife and daughter." If the organs from a deceased donor are found she will undergo a 20-hour operation at Addenbrooke's Hospital in Cambridge - the only one in the UK which provides multi-organ transplants. Surgeon Andrew Butler said the procedure, which included an intestine graft, was "rare and certainly complex". "We have carried out about 100 such procedures and internationally there have been around 1,500 bowel containing transplants in adults since 1992," he said. Ms Oddy was diagnosed with Crohn's disease, which affects the digestive system, aged 14 and has liquid meals fed through a tube. "I cannot wait to feel hungry and look forward to eating something," she added. "At the minute, six nights a week, a nurse comes to attach me to my feeds and that gives me all the nutrients." In September, Ms Oddy and her partner Laura married after she contracted sepsis for a third time. "We were pretty much saying goodbye," Ms Oddy said. "We decided I'd got that close that I wasn't going to live, it gave us a kick up the bum, and made us look at things a lot different." Her wife Laura said: "I'm terrified because there is that chance she might not pull through it, but on the other side, it could change her life. "We just want to be a normal family. We just want to work, spend time as a family, things that everybody takes for granted."